This sandstone fragment was once part of a nimbus, or halo, surrounding Buddha Shakyamuni seated beneath a bodhi tree, which can be recognized by its distinctive heart-shaped leaves. The tree is actually a fig tree (ficus religiosa), but became known as a bodhi tree because the Buddha reached enlightenment (bodhi) after meditating beneath one for forty-nine days. The two flying male figures are angels bearing garlands as offerings to the Buddha. Sometimes, by chance, a fragment calls attention to details that might be missed in a large composition. Here, our attention is drawn immediately to a delightful rendering of the tree that sheltered Buddha when he found enlightenment. Originally, a meditating Buddha would have been carved beneath it. Two celestials or angels swoop down from the sky, bearing flowers for the Buddha. Indians did not graft wings to their celestials like Europeans, but expressed flight through posture and billowing garments. Yogic postures and meditation are fundamental to Indian representations of deities and eminent teachers like the Buddha. Often they are shown seated below trees in quiet seclusion. The Buddha Shakyamuni chose to meditate under the pipal tree of the fig family. Because he achieved enlightenment— or bodhi in Sanskrit—under the tree, Buddhists call it the Bodhi tree. 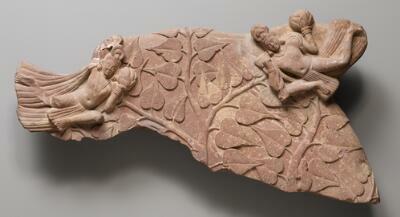 The tree is represented with carefully observed naturalism by an unknown sculptor. Its delicately veined, heart-shaped leaves are defined with remarkable clarity. At the right, a small squirrel scampers up a branch, unaware of the Buddha’s enlightenment.